Here we look at a more recent Anime offering directed by Hirotsugu Kawasaki. 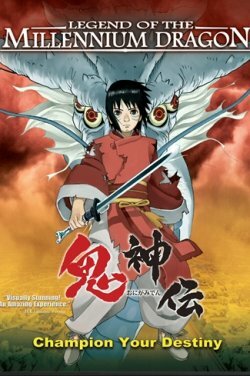 Legend of the Millennium Dragon follows the exploits of a young boy who is sent back in time some 1200 years to end the war between Humans and Demons. Now one of the key features of this anime is that it is hand drawn as opposed to CGG as many are nowadays. This in it self brings up the point of clarity and depth of the film. For me I quite liked the look of the film from it's outset and even though some characters may look less detailed then they should be compared to the backgrounds and and other effects ,i did Not think it distracted from the film it self . But how was the film ? This is the crunch of all reviews and with anime your reliant on the voice talent matching the characters on screen. Now the film evolves around a young school boy by the name of Jun Tendo who one day is attacked by a demon , he takes refuge in a Building which just happens to be the lodgings of a Monk named Gen'un . Now on the walls of the lodgings are pictures depicting creatures and demons and people throughout history ,some of the demons resemble the one that had just attacked Jun. The monk asks him about a birthmark he has on his chest (that of a dragon) . Though we never get to see the said birthmark ! Anyway he tells Jun about him being the chosen one, and with this Jun is whisked back in time 1200years or so to the Heian era. It's here that he is expected to help the human race against the evil Oni ,his goal is to awaken a demon dragon called the Orochi ( a 8 headed ,8 tailed dragon ) Gen'un the monk happens to lead the humans and knows that only Jun can awaken the dragon as he is the ancestral bloodline to a ancient clan. When the village is attacked by the Oni our not so heroic Jun is shocked and basically frightened (hell he just wants to go home) , but in a mad moment of fear he manages to summon Orochi and take flight on the beast . Though not yet full formed Orochi is a force to be reckoned with ,but to get to utilise the Dragon's full power he must find the sacred Orochi sword and then unleash the power within. Amongst the battle Jun gets sidetracked and injured ,he awakens in the Oni village ,who he discovers are just poor people living of the land ,they use special masks to give them a air of a demon . Now Jun must make a decision ,but first he must find the truth . Who is truly evil ? Are the Oni just poor and normal folk or are they evil ? Has Gen'un told him the truth or is he up to no good. A fellow warrior from the Heian village used to be a member of the Oni clan but left after the death of his parents , Junhad made friends with him at the Heian village ,his name is Raiko . Raiko is a true warrior and feels his destiny is to die in battle . Now Jun must decide what to do ,naturally a quiet and shy boy ,Jun is now head fast in a situation which needs his help and one which puts the fate of all mankind in his hands. When Jun finds out that Raiko Parents where killed trying to unite the clans he realizes that maybe Gen'un has not been so truthful . The truth be known ,Gen'un is a power hungry Monk who just wants the power of Orochi and the annihilation of the Oni. It will be up to Jun to take control of Orochi and bring down Gen'un's destruction . Now like I said I quite liked the look of the film from the outset , the story is quite simplistic in it's out line (there have been many stories of the Orochi in one form or another ) Now that's not to say the films flawless ,there are problems (this is NO AKIRA) One problem is Junis to most part a coward and scared through out the film ,he only really gets the feeling of duty and honour towards the end of the film . Now I watched this in the English Language version. ( it was late and subtitles where to tiring to read) , I could re-watch in Japanese but I don't think I will for a while. Now a big bug-bear was the character Raiko ,who though drawn well had some problems with his gender ,at times the character looked like a girl ,even down to the clothing ,but the minute he spoke this deep man’s voice came out ,he of course was a Male character but his facial depiction changed on occasion giving the appearance of a young girl . It really throws you at first ,especially when he first speaks. As far as the battles are concerned they are well thought out and the demon characters are well drawn ,i would have liked to see more actual traditional battle on the ground (like the Ninja scroll film) considering the time frame we where in. Many have said that character development has been left out and to a certain degree I would have to agree with them , there is one man in the Heian Village that tells Jun that there are other solutions possibly ,but we never get to explore his beliefs ,when Jun wants to visit him ,he is no longer of this world . But then any good Anime that gives you a story to make you wonder and visuals to delight usually have long run times . At a normal 90 minutes this film delivers what it can based on the time given. Legend of the Millennium Dragon won't blow you away ,but does entertain in a switch your brain of type of way , Maybe Rent it instead of buying unless of course you find it in the bargain section. But who in this world is Good or Evil and who's protecting Who?